True Roll: Marketing Hype or a Possible Achievement? Ideally all putts would start with perfect true roll. 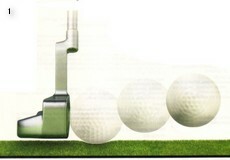 However, reality shows that the ball is initially airborne with backspin, then skids before starting its forward roll. Putter design using the latest anti-skid groove technology plays only a small part in achieving the marketing promise of True or Pure Roll. Rather it is a correct and repeating putting stroke that largely determines how soon your ball starts rolling smoothly across the green. If you, like many others, believe that your ball rolls end-over-end immediately after being struck, you are mistaken. Motion capture technology using high-speed cameras now allows us to see exactly what happens to the ball after impact. On contact the ball is launched into the air with a slight degree of backspin. This is a bit like what happens to the ball when you chip it. When it lands, it skids or slides across the grass until the friction created by the grass kills the backspin leading to ever-increasing forward roll. True Roll occurs when there is no longer any skidding. According to Frank Thomas, former technical director of the USGA, the distance from impact to pure rolling spin will be approximately 12 to 15 per cent of the distance the ball will eventually travel on a flat level putt. 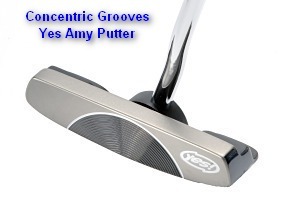 The grooves used in anti-skid technology hold the ball against the putterface a fraction longer than that of a conventional smooth-face putter. Improve the roll characteristics of the ball. Zero Loft - True Roll? Logic would also suggest that a putter with negative or zero loft would be the answer to the pure roll of the ball. It would create top spin and immediate forward momentum if you struck the ball above its mid-point. This could work, but only if your ball was resting on a sheet of glass and not on a grassy surface. On the putting green the golf ball rests in a slight depression. On a hard and closely-mown surface the indentation is less than when the surface is softer and the grass longer. Nevertheless to get your ball up on top of the grass, your putterface must have some loft. The purpose of loft is to get the ball level with the surface with minimum vertical bounce and rolling as soon as possible. The recommended degree of loft is subject to debate with most putters being built in the range of two to four degrees. However, it is the dynamic loft that you create with your putting stroke that counts most to achieving the quickest True Roll. If the ball is launched too high (too much loft), it will have more bounce and this extra bounce influences the distance the ball travels. If the ball is driven into the ground (too little loft), it will also have more bounce affecting the distance it travels. For example, on an uphill putt, the ball will strike the upslope and be checked. On a downhill putt, the ball will strike the downslope and kick forward. The rule of thumb on loft is that on fast greens you need less and on slow greens you need more. That said it is probably not a good idea to deviate from the built-in loft of your putter. In other words your putting stroke should consistently present the centre of your putterface to the equator of your golf ball without any variation in the putter's loft. Outside of the launch angle, how your ball rolls on the surface of the green is mostly beyond your control.